Chinchillas are nocturnal which means they sleep all day and are up making noise, playing and eating at night. This should be a major factor in your decision about whether a chin is a good companion for you or not. This is their instinctual time clock and we do not recommend trying to change them into diurnal (awake during the day) animals. As much as man has tried to domesticate the chinchilla, nature has the final word and some things you will never 'breed out of' them. Letting them stay how they are in the wild as nocturnal animals is what is healthiest for them. 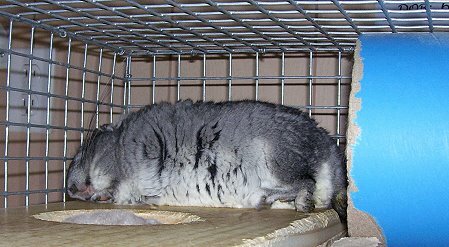 Many chinchillas will take a peek to look at you if you walk by them during the day, but will quickly go back to sleep. We have had others not move at all from their comfy sound slumber. They may get up briefly to munch on some hay or get a drink of water. They also have different times when they decide to get up for the evening. We have some that are ready to start to play by 8pm and others who sleep in and don't get going until 1am.